One of the oft quoted paradoxes of consciousness is that we are unable to observe or experience our own conscious minds at work; that we cannot be conscious of the workings of consciousness. I've always been puzzled about why this is a puzzle. After all, we don't think it odd that word processors have no insight into their inner workings (although that's a bad example because we might conceivably code a future self-aware WP and arrange for it to access its inner machinery). Perhaps a better example is this. The act of picking up a cup of hot coffee and bringing it to your lips appears, on the face of it, to be perfectly observable. No mystery at all. We can see the joints and muscles at work, 'feel' the tactile sensing of the coffee cup, and its weight as we begin to lift it. We can even build mathematical models of the kinetics and dynamics, and (with somewhat more difficulty) make robot arms to pick up cups of coffee. But - I contend - we are kidding ourselves if we think we know what's going on in the complex sensory and neurological processes that appear so effortless to perform. The fact we can observe and even feel ourselves lifting a coffee cup gives very little real insight. And the mathematical models - and robots - are not really models of the human neurological and physiological processes at all, they are models of idealised abstractions of limbs, joints and hand. I would argue that we have no greater insight into the workings of this (apparently straightforward) physical act, than we do of thinking itself. But again this is not surprising. The additional cognitive machinery to be able to access or experience the inner workings of any process, whether mental or physical, would be huge and (biologically) expensive. And with no apparent survival value (except perhaps for philosophers of mind), it's not surprising that such mechanisms have not evolved. They would of course require not just extra grey matter, but sensing too. It's interesting that there are no pain receptors within our brains - that's why it's perfectly possible to have brain surgery while wide awake. But this got me thinking. Imagine that at some future time we have nanoscale sensors capable of positioning themselves throughout our brains in order to provide a very large sensor network. If each sensor is monitoring the activity of key neurons, or axons, and able to transmit its readings in real-time to an external device, then we would have the data to provide ourselves with a real-time activity image of our own brains. It could be presented visually, or perhaps sonically (or via multi-media). It might be fun for awhile, but this personal brain imaging technology (let's call it iBrain) probably wouldn't provide us with much more insight or experience of our own thought processes. But let's assume that by the time we have the nanotechnology for harmlessly inserting millions of brain nanosensors we will have also figured out the major architectural structures of the brain - crucially linking the neural scale to the macro scale. Actually, if we believe that the recently announced European and US human brain Grand Challenges will achieve what they are promising in terms of modelling and mapping human brain activity, then such an understanding should only be a few decades away. 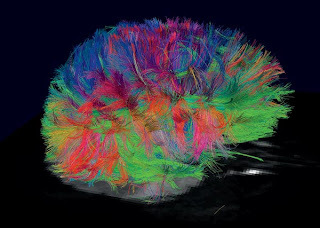 So now build those maps and structures into the personal iBrain, and we will be presented not with a vast and bewildering cloud of colours, as in the beautiful image above, but a simpler image with major highways and structures highlighted. Still complex of course, but then so are street maps of cities or countries. So the iBrain would allow you to zoom into certain regions and really see what's going on while you (say) listen to Bach (the very thing I'm doing right now). Then we really would be able to observe our own brains at work and, just perhaps, experience the connection between brain and thought. I'm very excited to be leading a new project called euRathlon - which is short for European Robotics Athlon. Up until now the project has been under wraps, but now - finally - we can go public. I'll explain a bit more about the process that led to here later in this blog post, but first - about euRathlon. It is an EU funded project to set up and run a series of outdoor robotics competitions. The focus is robots for search and rescue, or - more broadly - disaster response. Right now robots are not part of the standard equipment of emergency services, like fire brigades. But actually, robotics technology is coming close to the point where they could be and, in my view, should be. It seems to me that first responders should have robots as a standard part of their equipment, so that when there is a disaster robots are used as a matter of routine. euRathlon will, I hope, speed up the development and adoption of smarter robots for first responders. euRathlon is a new outdoor robotics competition, which will invite teams to test the intelligence and autonomy of their robots in realistic mock emergency-response scenarios. Inspired by the 2011 Fukushima accident the euRathlon competition will require a team of land, underwater and flying robots to work together to survey the scene, collect environmental data, and identify critical hazards. Leading up to this ‘grand challenge’ in 2015, will be directly related land and underwater robot competitions in 2013 and 2014, respectively. The euRathlon competitions will be supported by annual workshops for competitors. In parallel there will be an open process of developing benchmarks to allow comparison of different robots in the euRathlon competitions. Linked public engagement activities will connect euRathlon with robotics research, industry and emergency services, as well as the general public. Attendance of spectators will be welcomed, and we hope that euRathlon events will attract considerable press and media attention. By targeting a specific and urgent need - intelligent robots for disaster-response -euRathlon will provide European robotics with a platform for challenging, extending and showcasing European cognitive robotics technologies. Followers of this blog will know that I've been involved in the European Land Robotics Challenge (ELROB) for some years. I blogged about it in 2010: Real-world robotics reality check, and in 2007: A truly Grand Challenge. So, when the EU Framework Programme (FP7) issued a call for competition proposals late in 2011 an opportunity arose for those of us involved in ELROB to think about bidding for a new competition, building on that experience and extending our ambition. We were very fortunate to link up with the organisers of the Student Autonomous Underwater Challenge - Europe (SAUC-E), a very well regarded underwater robot competition. We then had land and sea robots covered. The final piece of the jigsaw fell into place when we were joined by our final partner, organisers of the workshop on Research, Development and Education on Unmanned Aerial Systems (RED-UAS 2011), with huge experience of aerial robots. The euRathlon consortium was complete, and together we submitted our bid in April 2012. Following evaluation the bid was successful and then, from September to December 2012, we went into a phase of project negotiation, in which we worked out and agreed the details of the project with the EC. That process concluded successfully, and the project started on 1 January 2013. So now, euRathlon is go!